Damaged airline luggage is at best inconvenient but at worst can seriously affect your whole travel experience. You can usually replace the damaged luggage piece but it can be more difficult if the content has been damaged as well. If your bag is damaged by the airline, you must file a luggage damage claim with them and you should do so as soon as possible. The rules vary between airlines but in the US, you usually have 24 hours to file a claim for domestic flights and 7 days for international flights. This is important, as sometimes the damage is not immediately noticeable. You may though have to return to airport with the damaged bag to file your claim. 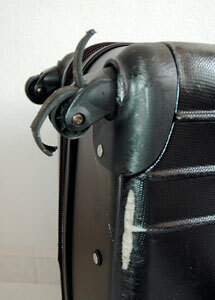 Failure to report damaged airline luggage within the time limit releases the airline from any liability. It is therefore recommended to inspect your luggage carefully at the airport so you can file your claim in person before leaving the airport (or at least report the damage). Most airlines have clear process how to make damaged airline luggage claim but this is an example of a Letter Of Complaint if needed. Most luggage manufacturers do not cover luggage abuse or mishandling by airlines. Your travel insurance might cover damaged luggage so always check your policy. You might be entitled to benefits beyond compensation for the damaged luggage. Your insurance company may also help you pursue your compensation claim with the airline. Avoid over packing your bag, it can cause zippers to break, handles to fall off, seams to burst, etc. Airlines are legally liable for damaged airline luggage but their liability is based on the depreciation value of your bag and its content, not the replacement value and there can be a big difference between those two. Furthermore, airlines are not liable for many high-value items when checked-in, e.g. cash, electronics, jewelry, artwork, fragile items, valuable papers, etc. You should keep valuable and fragile items like this in your hand luggage. Always have travel insurance with suitable content cover for your needs.